Photo courtesy Jack Dorfman/King's Courier El Camino's Kianna Hamilton-Fischer looks to score against the Cleveland Cavaliers. The team pulled out a gritty 40-30 win without hitting a single three against Cleveland. After a season of retooling last year, girls’ basketball and their new head coach Rai Colston, have come out of the gate hot to start the season, defeating some of the top teams in the area and the nation before starting West Valley League play undefeated at 4-0. The girls are led by their senior captain and Cal State Long Beach-commit Kianna Hamilton-Fischer, who has been on varsity for all four years of her high school career. Even taking Hamilton-Fischer out of the equation, the team is filled with scoring depth and height, and has an equal spread of seniors and young talent that looks to keep El Camino near the top of the City Section for years to come. In their league wins, the team cruised early on. Victories over Chatsworth, who they dropped 81 points on, Taft and Birmingham, and defense helped win them the game against Cleveland. The girls had a much harder time with Granada however, losing to the rival Highlanders 58-29. 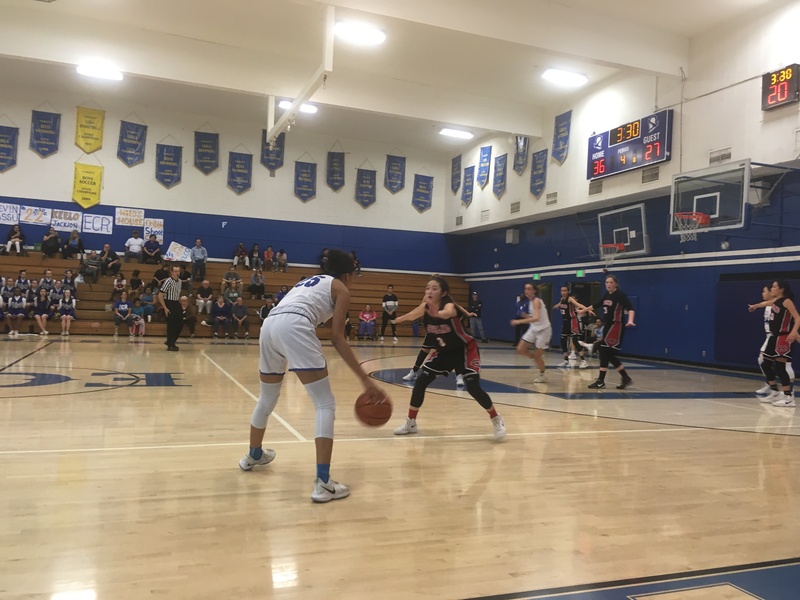 Over winter break, El Camino hosted the second annual Conquistador Classic, and the girls’ made it to the finals easily. In blow out wins against Calabasas, Arleta and Burroughs, the team’s defense stepped up, only allowing 66 points combined over the course of those three games. In the tournament championship, the team matched up against Chaminade, a top 50 team in the state according to Maxpreps, and came up just short, losing 55-46. Besides the classic, El Camino also hosted the Harvard-Westlake Wolverines, who at the time were ranked fourth in the nation, and were able to beat them 53-49 in their first game of 2018. The win, among others against St. Bonaventure, Hueneme and St. Anthony, boosted El Camino into the top 80 in the state, according to Maxpreps. From that point on, El Camino went 8-2 before playing their chief rival, the Granada Hills Highlanders, in league play. After the loss to Granada, the Conquistadors went on a 4-0 run heading into a matchup with Chatsworth that precedes their league finale. In that 8-1 run, the team consistently was able to put up points, only scoring under 50 twice, and a large part of their success has been due to their chemistry. The team likes to push the pace, and the great benefactors of this so far have been the guards. Playing alongside Hamilton-Fischer, junior Orelle Gelbart and sophomore Rebecca Saidoff both can consistently hit shots from behind the arc and are great passers especially in transition. When the offense does set up, senior Kyra Jacks and sophomore Iliana Camua both benefit, as both have solid post moves and can grab offensive boards for the Conquistadors. The team’s most important game will come on the last day of the season, as they play the Highlanders at home to decide the West Valley League on Friday.